"You tread on the heels of the many, till you come where the ways divide." AS A PUP, I was fascinated by the adventures of Huey, Duey and Louie Duck, nephews of Donald. Invariably they would find themselves in the most amazing pickle, surrounded by ominous foes and impassible terrain--lodged between Scylla and Charybdis as it were. But just as fate's dark hand was set to strike down, Huey would pull out his dog-eared copy of The Junior Woodchuck Manual, scan the index for the appropriate entry and, Lo and Behold, there would be a concise step-by-step procedure dealing with the problem. Good documentation is a thing of joy and can save your life in combat. On a recent sojourn to the Tech Museum of Innovation gift shop, I stumbled upon Martin Cheeks' guidebook Silicon Valley--and was immediately transported into the feathery body of Huey, paging through the awful but wonderful dark secrets of the Woodchuck Manual. There is so much useful information about Santa Clara Valley in Martin's opus that it is downright scary. The book fulfills all the basic requirements of a guidebook and then takes off in unexpected directions: an amusing discussion explaining the differences between silicon and silicone, the story of the "incendiary love letters of General Naglee," a Silicon Valley geek glossary informing that "square-headed girlfriend" means a computer and that "percussive maintenance" equates to, in Martin's words, "giving a computer a hard whack in an effort to get it to work correctly." I was hard-pressed to find anything askew with Silicon Valley--only a couple of nits. When Martin discusses San Jose's distinction of being the last California city to host a public lynching (St. James Park, 1933) he describes the two victims as being hung from the same tree: ". . . Holmes battled hard for his life, but eventually he, too, swung from a second rope on the same tree." In fact, Thomas Thurmond was hung from a mulberry tree, and John Holmes from an elm tree a few feet away. They had kidnapped and murdered San Jose's favorite son, Brooke Hart. Although Martin bravely discusses the Quetzalcoatl and Fallon statue controversies--the mere mention of which causes grown councilpersons to cry and mayors to wince, he fails to mention the disturbing stories of vicious albinos holed up in the mountains surrounding Alum Rock Park. Some claim the reports are nothing more than urban myths fostered by parents to encourage their children to exit the park before dark--I think not. The $970,000 missing from the Alum Rock School District may very well be in a dank sulfuric cave above Penitencia Creek--being counted by misbehaving albinos. Also missing from Silicon Valley is any mention of the annual Bark in the Parktm dog festival held in Naglee Park (San Jose). This omission is more egregious in nature, as the event is the finest celebration of dogdom in Santa Clara County. Here, one can buy canine furniture, purchase rabies shots or walk with a beloved pooch into misting tents. Last year, dogs as proud as butlers demonstrated their skills in grassy circles as the Mike Sloan Big Band played old-time jigs in the distance. 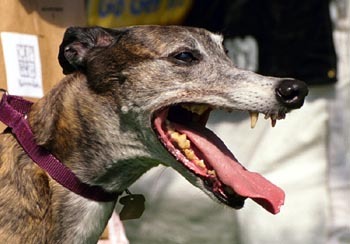 Particularly impressive were greyhounds, whose elegance puts all other dogs to shame, making them look like mutts and curs when placed alongside. The 2001 version of this ritual occurs on September 8. Be there with your dog. Martin is forgiven for leaving out The Bark--it is a rare oversight. His droll reporting of L'Affaire du Francais Mysterieux, Local Boys Make Good, Rough Rider Teddy Plants a Tree in Campbell, Mountain Charley, and Mansions, Mushrooms and Marilyn Monroe is atonement enough for a venial sin. Final Note: I fell in love with greyhounds last year. Many claim that they make superlative, loving pets. But they are fast, and if they break from their leash they have the ability to run very far, in a very short period of time, becoming disoriented and lost. Like NASDAQ. From the July 5-11, 2001 issue of Metro, Silicon Valley's Weekly Newspaper.